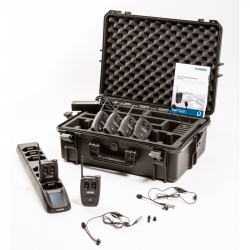 The Guardian Plus is a hands-free, secure full duplex intercom system (AES128 encryption). It does not require any fixed or central relay nor basestation. 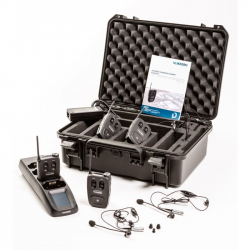 Its patented noise filter ensures perfect communication in noisy environments. Simple, intuitive and economical, it helps to improve each of your events. The VOKKERO GUARDIAN PLUS is a mobile radio terminal dedicated to audio professionals and all those who want a high quality listening. 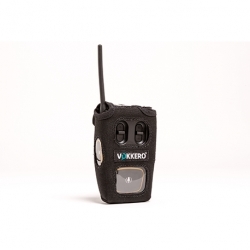 This Wireless Interface (WI) enables a connection between a Vokkero® system and a compatible fixed-installation 4-wire intercom system. 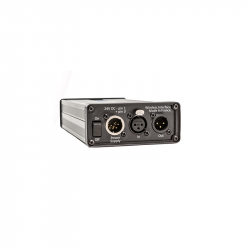 With the PRO 460 extension cable you can connect two Vokkero terminals systems via an audio cable. Users are able to communicate without physical obstacles. For situations where the RF signal is not good enough next to the wireless interface. Audio cables with XLR connectors compatible with the DBS 010 audio console and 4-wire Wireless Interface. Able to transport up to 4 terminals and their accessories. Adapter cable to allow a perfect synchronization between your accessory and the VOKKERO Guardian. The Guardian charging extension can be associated with the Guardian charger to reload / configurate 3 additional terminals or batteries (per extension).